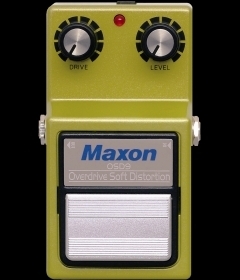 Choose Maxon for distortion. People often said that for the legendary overdrive OD880 swept the music scene in 1977 - 1980’s. OSD9 is an updated version of original Maxon OD880 Overdrive/Soft Distortion. OSD9 has two controls like OD880. Creates natural, soft and warm distortion like the sound of a tube amplifier. Original UA741 op-amp installed for overdrive circuit offers low-noise overdrive sound. OSD9 has a passive type distortion circuit which differs from OD808/OD9. True Bypass Switching with 4PDT mechanical switch. No tone changes when switching bypass and effect. Two-way power operation, using 9V alkaline battery or optional AC adaptor. 9V alkaline battery, more than 34 hours. Easy-access, tool-free battery compartment.